The US market fell during the month, with the so-called ‘FAANG’ stocks leading the way. Netflix shares fell by almost 20% on a second quarter of disappointing subscriber growth. Rumours of an imminent deal announcement caused volatility in Sterling at various times during the month, though no details have been published. The Irish border appears, from comments, to be the sole issue that is now holding up an agreement. The proposed Italian budget deficit of 2.4% of GDP was rejected by the European Commission, leading to an increasingly heated debate between Italy’s new government and the EU. The outlook from the Bank of Japan, released on 31 October, remains relatively optimistic. The BoJ sees Japan continuing to grow, amid a virtuous cycle of income and spending growth in both the household and corporate sectors. Inflation expectations were reduced slightly. The election of Jair Bolsonaro to the presidency of Brazil saw Brazilian stocks rise 10.2% in October (as measured by the BOVESPA in local currency terms). He is perceived to be more market friendly than Fernando Haddad, of the opposition Worker’s Party. 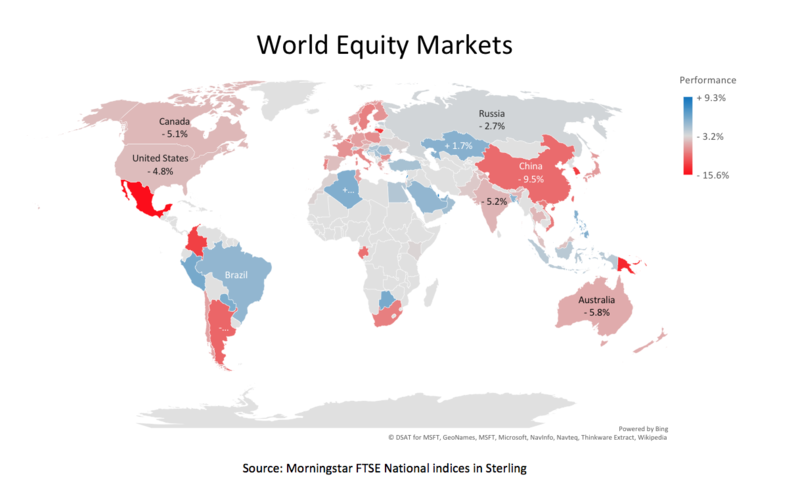 During the month, the best performing major markets were the UK and USA, both of which fell by 4.8% in Sterling terms according to the FTSE Country Indices. Asian markets saw large falls, with Hong Kong being the worst of these, losing 9.7%. Japan was helped by a stronger Yen and fell by only 6.7% in Sterling terms. Emerging markets continued to be weighed down by a strengthening Dollar and among these, Mexico was the largest faller, recording a loss of 15.6%. The exception was Brazil, which rose by 19.8% as the markets warmed to the new President. 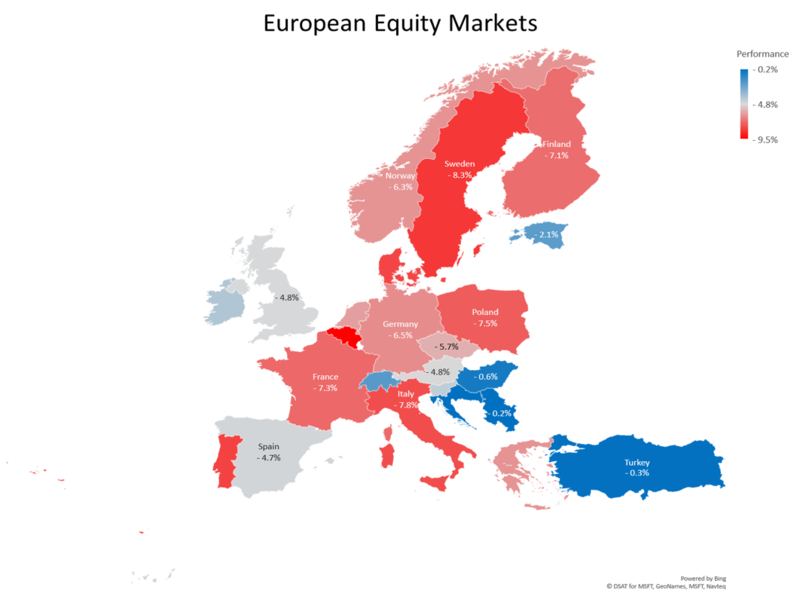 European markets in October extended losses from the previous month, with no market achieving a gain. The core markets, Germany, France and Italy all fell heavily as Angela Merkel resigned as leader of the CDU but remained as Chancellor, and Italy had its budget rejected by the EU. Peripheral markets, on the whole, fared better. The worst return came from Belgium, which lost 9.5% and the Nordics also had a weak month after holding up well previously. Year-to-date Finland has lost only 2.2%, with Sweden flat and Norway up by more than 11%. 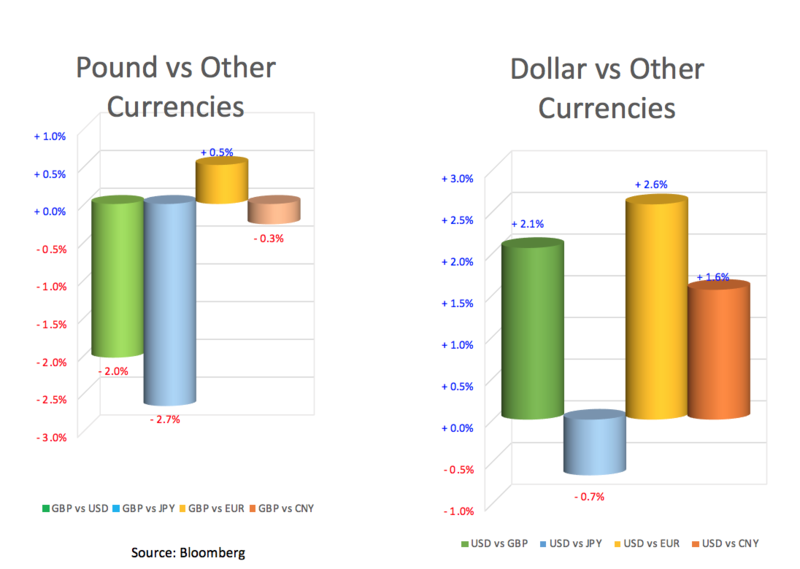 News flow from the Brexit negotiations, as we approach the November deadline for a deal, caused Sterling to have a volatile month, with the Pound ending mostly down against other major currencies, with the exception of the Euro, which also had a poor month. Mrs Merkel’s political difficulties and the Italian budget led to a lack of support for the currency. Continued strong economic data, and hopes for an agreement with China over tariffs, as well as a flight to safety, saw the Dollar continue to strengthen ahead of the mid-term elections. Strong economic data saw US bond yields move higher again in October, despite President Trump expressing concern over the Fed’s tightening policy. In the UK, with little prospect of a rate rise in the next six months, and weakening data, buyers emerged for UK debt, leading to a good month for bonds and a decrease in the yield. Peripheral European bonds continued to weaken as the Italian budget weighed on sentiment and investors switched into ECB and core EU bonds. October is often perceived as a potentially challenging month for stock markets; we had the Wall Street Crash of Oct 1929, the Oct 87 crash, the Great Financial Crisis is generally regarded to have started in Oct 2008 and now we have ‘Red October’, when the S&P500 fell -6.9%, the FTSE All-share fell -5.4%, Europe -5.9% and the Nikkei also dropped -9.1%, though it had been the strongest market the previous month. The S&P gave up all its gains year to date, whilst the FTSE All-Share closed the month -7% lower than at the start of the year. Dissecting a broad market sell off– and identifying and grading the various catalysts – is tricky given the complexity of modern markets, but there seem some obvious starting points. The initial trigger does seem fairly clear. US Treasuries had been selling off all summer, but some very strong economic data and bullish comments from the US Federal Reserve Chairman in early October fanned fears of a faster pace of interest rate hikes and sent US 10-year yields up sharply to an eight year high of 3.26%. The ferocity of the move in the US Bond market was probably made worse by events in the money market. The persistently strong US Dollar has made hedging costs for overseas buyers of US Bonds too expensive and once this cost is taken into account, the real yield on US bonds for foreign buyers is less attractive. With the rising US budget deficit (post the Trump tax cuts) leading to increased issuance and foreign buyers stepping away, we had a situation where there were more sellers than buyers and as a result US Yields were moving higher. 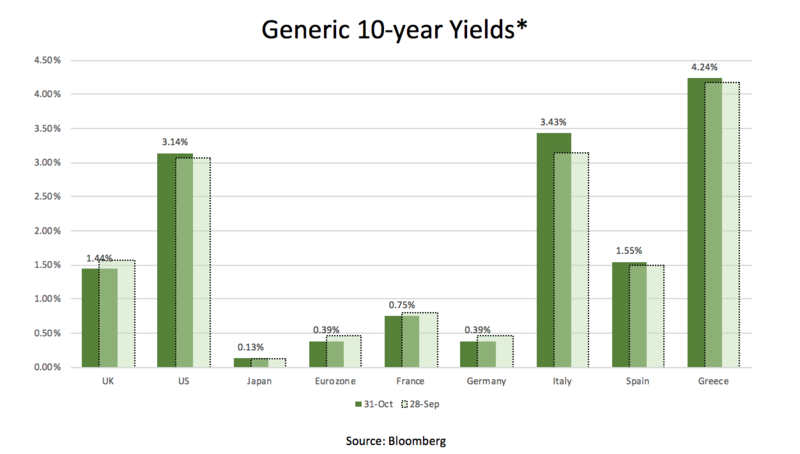 Unlike previous equity corrections, US Bond Yields rose during the month. US bonds remain highly volatile and may no longer be the default ‘safe haven’ that many investors have assumed in recent years. The equity market’s prior assumption that the Fed will ride to the rescue when equities sell off, seems to no longer apply. This bond sell-off then bled into Equity markets, especially the high-flying technology stocks that had powered much of the rally. Other factors were also involved, such as the sense that the tech rally was overdone, trade tensions, rising short term interest rates making cash a viable asset again, worries over the Fed’s balance sheet shrinkage and concerns that it was as good as it gets for US corporate earnings. Many US tech stocks were priced for earnings ‘beats’ and ‘upgrades’, but some were offering ‘in-line’ and no change to estimates. A gradual decline in US stocks suddenly turned into an unnerving late afternoon slide on Oct 10th – the day after US Treasury yields peaked – when the S&P fell -3.3%. Computer-powered, algorithmic investment strategies reacted to this surge in volatility, which added to the selling pressure. The growth in passive investing in recent years along with regulatory changes has resulted in a thinning out of equity liquidity in markets, which in turn adds to the influence of these high-speed algorithmic traders. An additional factor has been the poor performance of traditional long/short hedge funds, which increasingly had crowded into tech stocks and collectively got their fingers burnt as the month progressed and delivered one of the worst monthly performances for their investors since the 2008 Financial Crisis. Selling pressure from the Hedge Funds added to the downward pressure on markets. Towards the end of the month, some of these selling pressures eased. US economic data continued to be strong and corporate earnings offered reassurance – the bargain hunters were able to come in and markets staged a modest late month rally. 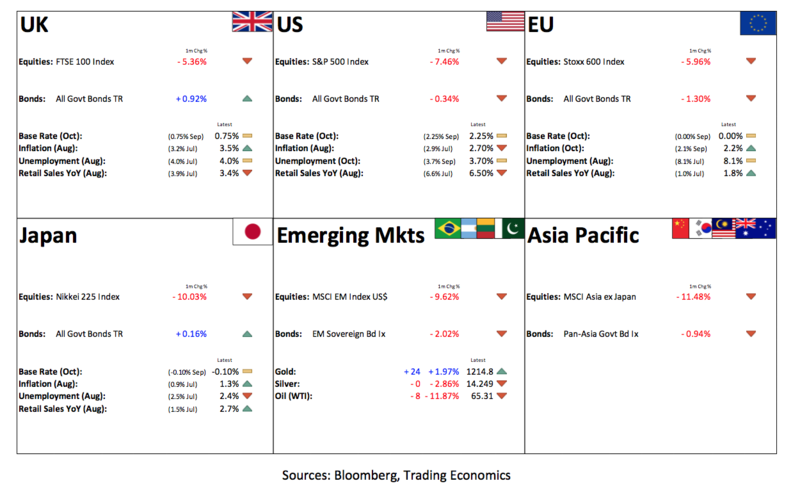 There were obviously other localised factors at play – Brexit in the UK, the Italian budget standoff in Europe - but the events in the US were replicated across all major markets. Looking back over October, US Economic data remained very robust, but European macro numbers are going in the opposite direction. The US trade dispute with China shows no signs of resolution and there remains little signs of progress on Brexit. Merkel’s decision to step down as President of her party may yet result in a German Federal election next year. The US Dollar continued to strengthen, which remains a headwind for emerging markets and for non-Dollar denominated global investors. Within the market correction, we have seen weakness in smaller companies and an end to the onward and upward march of growth stocks and the so-called US ‘FANGS’. The volatility that we saw earlier in the year has returned and investors are now more conscious of the downside in both equity and bond markets.